Water quality managers have been utilizing thresholds and tipping points concepts to inform their decision-making for many years. From establishing water quality standards, to setting Total Maximum Daily Load (TMDL) thresholds, non-linearities are commonly used to inform crucial water quality management decisions. The Ocean Tipping Points team has been working to further the incorporation of tipping points concepts into the way water quality is managed by focusing on ecosystem-level tipping points and how to avoid or respond to them. 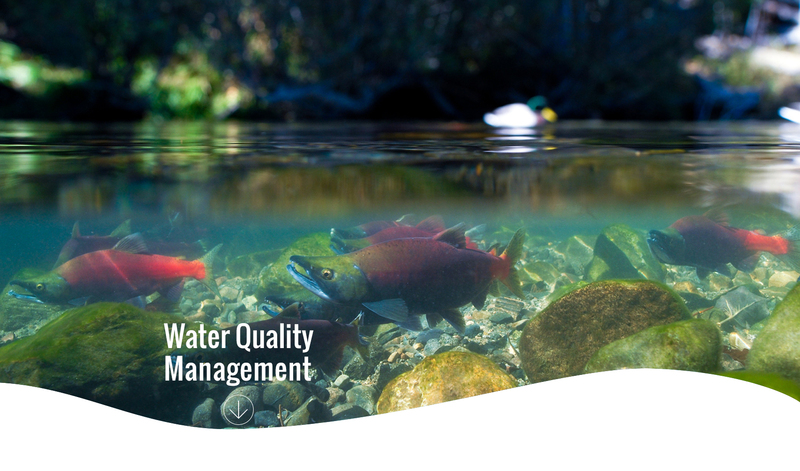 Here you’ll find resources and guidance to help you increase the use of tipping points concepts and science in your own decision-making to help improve your water quality management. Why should we care about tipping points in water quality management? Maintaining water quality in marine ecosystems is critical to both human and ecological well-being. Human activities such as changes in land use, agriculture, and industrial processes can and have led to major ecosystem changes in marine, estuarine, and freshwater systems around the globe. Global examples of shellfish die-offs, toxic algal blooms, loss of seagrasses, and large fish kills have all resulted from tipping points in water quality. The economic effects of marine harmful algal blooms in the United States alone have been estimated at $82 million per year, which includes economic losses for fisheries, recreation, and tourism, as well as public health related monitoring, and management expenses1. Science that directly addresses these types of ecosystem-level water quality tipping points can provide managers with the knowledge necessary to not only anticipate and avoid ecosystem tipping points in the future, but also to help recover ecosystems that have already crossed critical thresholds. Management strategies that include identifying tipping points and integrating them into management targets have been shown to be more effective in achieving management goals than strategies that do not consider potential tipping points2. Passed into law in 1972, the Clean Water Act has helped restore and maintain water bodies across the United States in part through the use of thresholds, ensuring our waters are suitable for both human and aquatic life. There are three major ways that water quality managers are already using thresholds to manage under the Clean Water Act: through establishing Water Quality Standards, Total Maximum Daily Load (TMDL) thresholds, and setting Discharge Limits under the National Pollution Discharge Elimination System (NPDES). By incorporating more science around ecological tipping points into these existing decision-making processes, you can begin to move beyond just focusing on technological or human health based thresholds to incorporating knowledge of ecosystem level tipping points to further improve your water quality management outcomes. Given the current decision-making processes surrounding water quality decisions, doing this does not require large shifts in effort. In addition, new information on ecosystem-level tipping points can help to support implementation of an ecosystem-based approach to management that reflects the best available science. Click on the links below to learn more about how ocean tipping point science aligns with and can further bolster the development and implementation of water quality standards, discharge limits and TMDLs. Find out more about integrating tipping points concepts into water quality management under the Clean Water Act. For more information on how to apply tipping points science to your own adaptive management decision-making visit our Ocean Tipping Points Guide. If you are looking to dive deeper into detailed analysis tools that may be most useful to you to help improve your own water quality management, see our table of scientific analysis tools. In Florida Bay, managers have been successful in applying threshold-based targets and routine monitoring to mitigate rapid ecosystem degradation. In the 1980s, the South Florida Water Management District (SFWMD) identified declining freshwater inputs as a key driver of declining water quality and the cause of seagrass die-offs in the bay. To restore and maintain seagrass ecosystems, the SFWMD created the Minimum Flows and Levels Program that explicitly incorporates a minimum threshold of freshwater input into the bay into management targets. If the minimum threshold is breached, upstream municipal and agricultural water uses are prohibited until water delivery is restored. Since the implementation of tipping points science into their management, water quality in Florida Bay has improved and there have been no seagrass die-offs. Chesapeake Bay has seen an increase in ecosystem health since incorporating tipping points science into their decision-making by establishing ecosystem-based Total Maximum Daily Load (TDML) requirements. Chesapeake Bay is the largest estuary in the United States; coastal development and other land-use changes over the last two centuries have led to increasing amounts of nutrients and sediments entering the Bay, creating “dead zones” that cannot support aquatic life. In conjunction with overfishing, these dead zones have resulted in huge losses of submerged aquatic vegetation and associated fisheries species. In 2010, the Environmental Protection Agency (EPA) established a significant and comprehensive Total Maximum Daily Load (TDML) requirement that sets limits on nutrients and sediments running into the bay, with heavy and severe accountability measures. This requirement divides pollution limits by jurisdiction and major river basin and is based on monitoring data, peer-reviewed science, and modeling tools. Collaborative efforts continue for the restoration of Chesapeake Bay and targets have been set for increased reductions in nutrient runoff by 60% in 2017, with a full restoration goal set for 2025. Kelly, R. P., A. L. Erickson, L. A. Mease, W. Battista, J. N. Kittinger, and R. Fujita. 2014. Embracing thresholds for better environmental management. Philosophical Transactions of the Royal Society B 370:20130276.